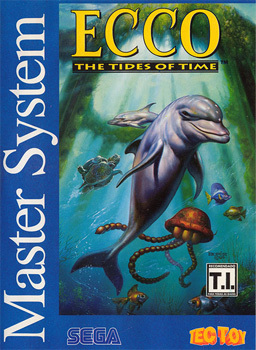 Translated from Portugese: It's been some time since Ecco defeated Vortex, a dangerous monster whose only objective was to all of the living creatures that inhabited the traquil waters of Home Bay. These days things are calm, but this can quickly change... In the farthest, deepest parts of the ocean rumors have it that new problems are beginning to appear. 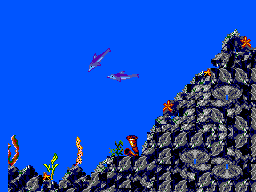 According to the rumors, the race of Vortex was ruled over by the Vortex Queen, who could create a true army and initiate an attack on Ecco's colony. 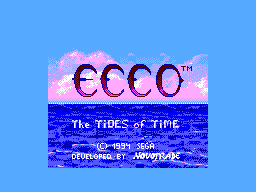 Join Ecco in this incredible adventure, where you'll travel the seas of all time facing the most dangerous of enemies, all with the most important of missions: prevent the pervese Queen of the Vortex from exterminating the population of Home Bay!! During the game, hold 1 + 2 to display the map. 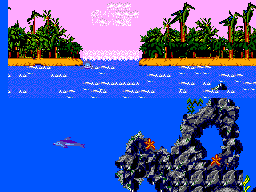 At the map screen, press Left, 1, 2, 1, 2, Down, 2, Up. The cheat menu will appear, but the cursor will be out of alignment (but the code still works).